By Daniel Horowitz-- Business leader and philanthropist Seymour Schulich has announced a historic $100 million scholarship initiative to secure the future economic competitiveness of Canada and Israel. The scholarships are designed to ensure that future Canadian and Israeli leaders are among the next pioneers of global scientific research and innovation. The Schulich Leader Scholarships are aimed to increase enrollment in STEM subjects – Science, Technology, Engineering and Mathematics – among students entering Canadian and Israeli Universities. All graduating high school and CEGEP students in Canada and Israel planning to study STEM subjects in university are eligible to become a Schulich Leader. Each selected individual will receive a $60,000, four-year scholarship with annual payments of $15,000. Twenty Canadian and five Israeli Universities will be invited to participate in the program. Each will award one Schulich Leader in the first year for a total of 25, a number which will rise to 75 students by 2014. Nominations to these universities will be made by 1600 high schools in both countries. Ultimately, the endowment will generate $5 million annually, and be indexed to inflation. 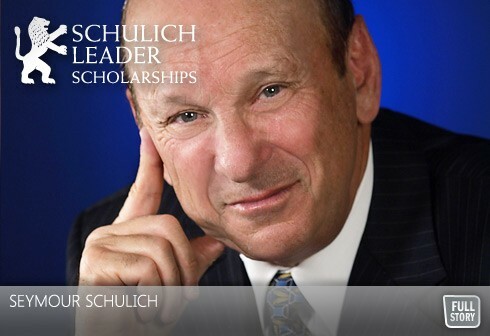 Schulich has selected UJA Federation of Greater Toronto to be the administrator of this scholarship program. "UJA has been around for close to 100 years, and he believes we'll be around for another 100 years," explained the acting director of the Schulich Leader Scholarships, David Goodman. And, according to UJA Federation President & CEO, Ted Sokolsky, if interest and investment revenue keeps up with annual endowments, "it could go on forever."